I spent five or six hours at the emergency vet today with Emmy, who hurt her foot/leg yesterday while on squirrel patrol in the yard. It’s not broken (unless the radiologist sees more than the emergency vet did), but her foot is swollen and she’s limping. 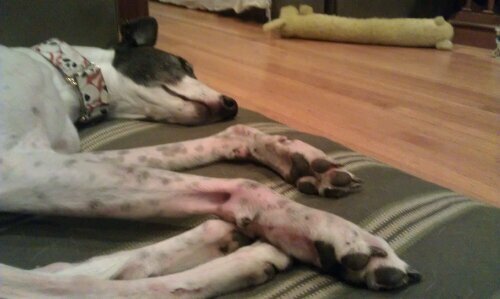 She scrapes up her feet and legs a lot in the yard, but this is the first time her limping lasted more than an hour. It’s been over 24 now. She has a slight fever and is resting a lot. I’m glad it’s not worse! My mom had a scary medical incident a few days ago and we are all grateful she’s home and feeling good now!! Not much else to report. I rode my bike to the Irvington Halloween Festival this weekend (funnel cake!! Did you know there is different batter for an elephant ear, which has cinnamon sugar, while the funnel cake gets powdered sugar?) and I’m working working working. Clover continues to heal. Happy Halloween tomorrow! I haven’t busted into the candy yet. I went on vacation last week (hooray sunshine) and Clover and Arliss’ former staff took charge of the dynamic duo. Arliss apparently held audience with several worshippers. 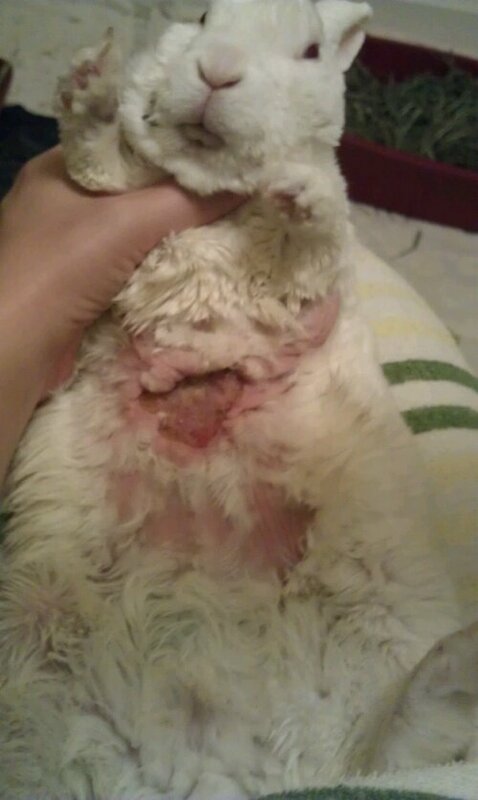 Clover continued his healing, and he had a checkup with a vet in the Cincy area. (Note: Arliss charged the clinic cat and put him in his place.) The vet said she thought Clover had been bitten by a brown recluse spider, based on having seen similar wounds in a couple of small, fat dogs. She thought his extra fat may have protected his organs and saved him. The wound is healing extremely well, especially along the bottom. The top margin still has some pus forming but my vet saw him again today and said he’s doing excellent and decided not to surgically repair anything after all. It’s now looking like it’s a wolf spider, which is great in that it’s not an infestation of brown recluses (! ), but that doesn’t mean it’s all fun and games because 1. we’re still not sure what injured Clover and there could still be a renegade creature in the house, and 2. wolf spiders aren’t a whole lot better. The ones I’ve seen haven’t been big or hairy, so I didn’t consider that’s what they were. Except… they’re probably all babies and look out when the rest of them grow up. UGHHHH. Also, apparently they bite and are poisonous too… maybe not so bad for humans, but certainly a problem for a little bunny. Side note: David placed spider glue traps in the bunny area while the bunnies and I were gone, and when I brought them home, Clover promptly got stuck in the trap. Olive oil works great to free bunnies from glue traps, in case you wondered. So I guess it’s time to call an exterminator. 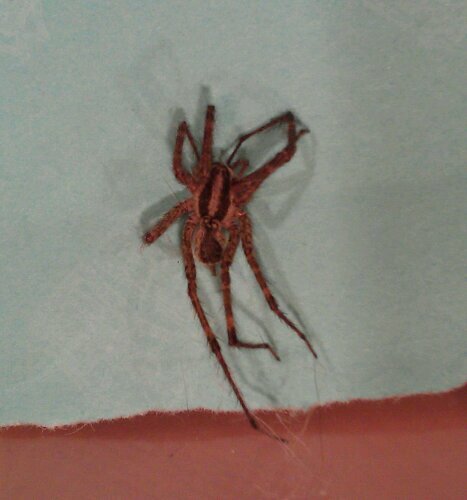 I hesitated when we thought it might be brown recluses, because I read that when you spray you just kill their food and then they become more aggressive! But if it’s truly an infestation we have to do something. And it better be before any wolf spiders grow up to full, hairy size. I remember them from camp when I was a kid and OH MY GOD you may as well let a thousand tarantulas loose in my house. 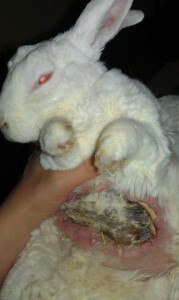 As described earlier, Clover had a big cleanup of his huge abscess at the vet on Monday. I don’t know WHY he’s doing so well, but he’s (mostly) eating and seems to be pretty comfortable. He and Arliss came home yesterday. He’s on penicillin injections and I need to clean the belly area daily, but otherwise we just wait and see and let him heal. It seems like he should be in shock or dead to look at this, but the vet (and let me give a shout out here to her, Angela Lennox of Avian and Exotic Animal Clinic in NW Indy) says the nerve endings at the periphery died off when the tissue necrotized, so he doesn’t seem to notice all this drama. He is messing with the drain a little bit (the tubing that holds open the hole near his elbow) but we’ll be removing that soon. Barring more pus forming, we can either let all this granulate in over the next several weeks, or go in after a week or so to surgically help it along with the loose skin he has after losing some weight. It’s likely to need surgical help to encourage it to heal anyway where the edges are not well connected. For now, let’s hope he continues to feel good and eat well and be a good patient. He’s not even on pain meds right now! But he’s been squinting his eyes a bit, so I think I’m going to put him back on an NSAID for discomfort. Clover update. Poor little guy. 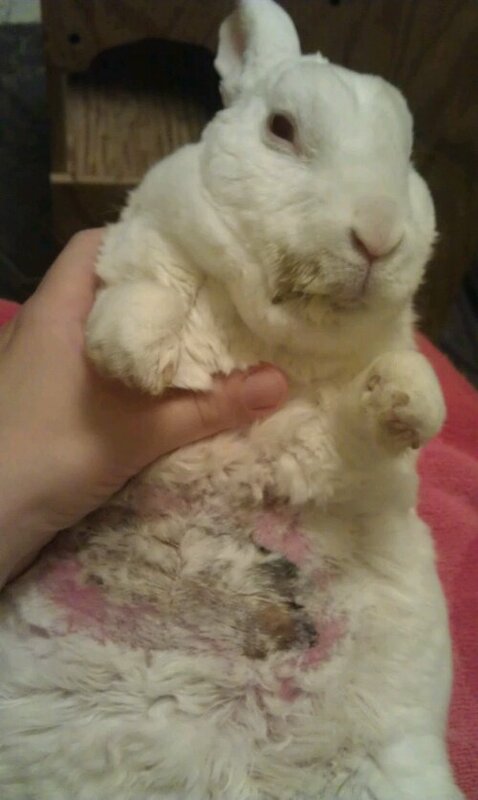 In a previous post I showed Clover bunny’s belly with a large painful bruise appearance that went necrotic. He’s also been limping on one front leg. He started eating again last Thursday (he’s been on meds and syringe feeding for awhile now) and as of this weekend was feeling himself again, even running to greet me when I came in the room, although his front left elbow swelled up to golf ball size. And while he lost a lot of weight, he needed to lose weight after pigging out on his pal Arliss’ food the last several months, so he’s actually back to an appropriate size for a mini-rex (I used to call him maxi-rex). He’s been back to the vet several times and I was happy that the edges of the bizarre wound were finally defined–no more dying tissue, which left us with an area we could treat or work with. One plan was to surgically remove the large dead area and stitch the skin closed, and due to losing a sixth of his weight since May, he needed a bit of a tummy tuck anyway so there was extra skin to work with. Others suggested letting it be a ‘natural bandage’ and have it heal on its own. 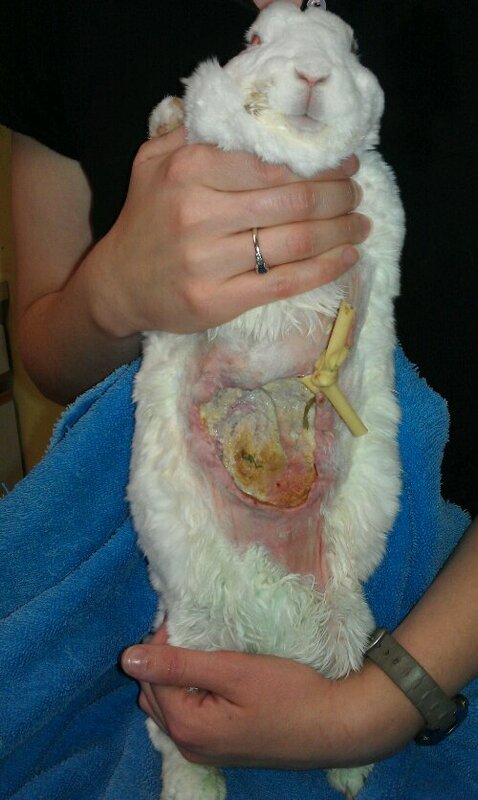 Several rabbit experts and vets have seen the pictures over the past couple of weeks and possible causes were posited as a burn, squeezing too hard during recent bladder expression, pooling/contaminated sub-q fluids that killed the vascular supply to the area, or a traumatic injury like being kicked. None of these seemed to fit well and some were basically impossible. This is how it looked Sunday morning, which is gross but an improvement since it seemed to have stopped getting worse and he felt so much better. The mess at his mouth is because he needs a napkin when I give him meds and food! But today he saw the vet and we found out what it was… a giant abscess. Squeezing on the ‘swollen’ elbow causes pus to come out his belly area. 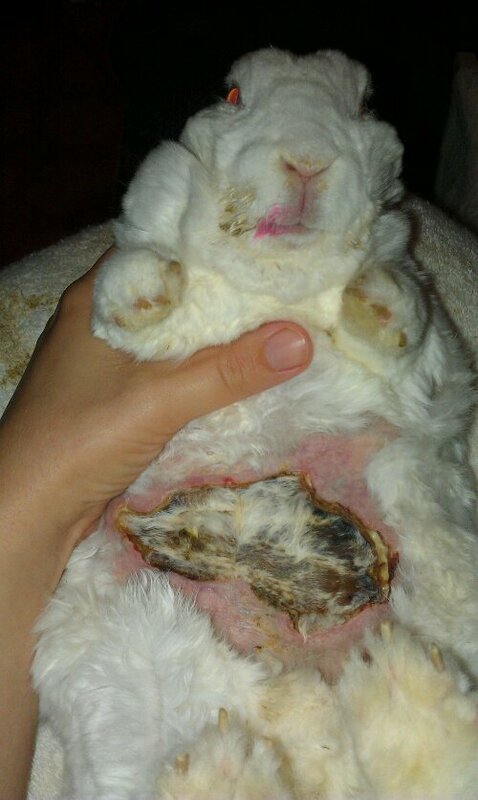 It’s a big awful mess and now he has a giant open area on the belly which can’t really be stitched shut because of how extensive the abscess is. Nor can it all be excised because it’s so large. He has a drain in it but he’s likely to chew it out. Clover needs lots of good wishes. The aftercare is going to be hard and the prognosis is difficult for any abscess that can’t be adequately removed and flushed. He also did poorly with anesthesia and had a really traumatic day on top of this horrible injury. Updated picture 06 Oct 11: have been back to the vet a couple times. Still up in the air about surgery but as it opens I am finding it harder to feel like I’m helping him (and experiencing a weak stomach too). He’s not eating anything but greens so several times a day I am syringing food and several medicines. I worry about hurting him, though at least he’s getting around better now. I wish he would eat. 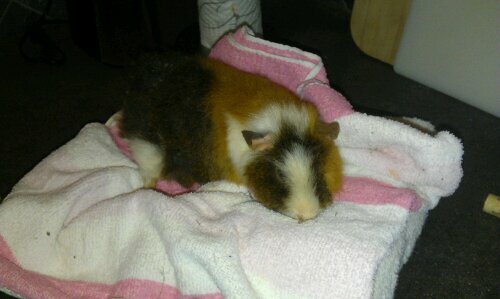 Also last night my little piggy buddy Frisco died. He’s been sick a long time but had a lot of good days. He passed relatively peacefully on a day when he woke up squeaky and enjoyed his greens. I think this might be the first time in twenty years I didn’t have a guinea pig. Poor Clover (Arliss’ buddy) was in the hospital two weeks ago for bladder sludge (minerals in the urine that accumulate as crystals and cause him to “pee sand”) and then last week went in for this horrible bruise thing on his belly that has turned into dead tissue. I’m mostly posting it so I can link to it from another bunny list to get some opinions, but please keep him in your thoughts because it looks like he’ll need surgery this week to excise the necrotic portion. 🙁 Also he is barely eating, poor little guy.